When user prints label from LABEL MATRIX, the printed labels is misaligned with the label stock. The top part of the label is missing. The label retract or back-feed option was not selected. When running in tear-off mode, most thermal printers will forward the last printed label to about .25″ to .5″ to allow the user to cleanly tear off the last label. This typically positions the gap between the labels on the edge of the tear-off bar. However, if the printer were to start printing the next label job in that position, it would miss the top of the first label by that .25″ to .5″ space. If using the gap sensor, the printer might forward to the next label which wastes a label. Thus most thermal printers have a retract or back-feed option. 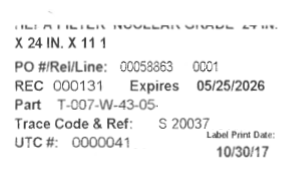 We observed that when printing the first label, the printer did not retract the label into the printer prior to printing. 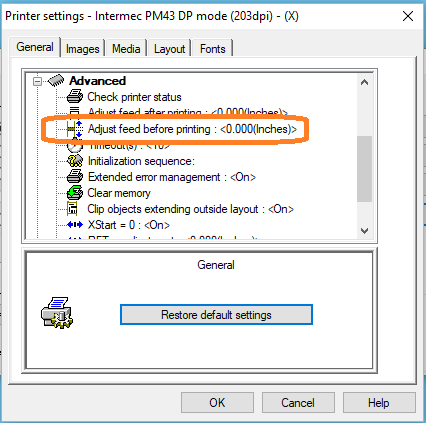 For the Intermec PM403, the solution is to set the printer driver to retract the label (Advance the label by -0.4″). You may need to experiment with the actual value. For printers from Zebra or Sato, this feature is call Backfeed. The option will need to be enabled. For Datamax printers, the option is Vertical Offset. It needs to be set with negative value similar to the Intermec.